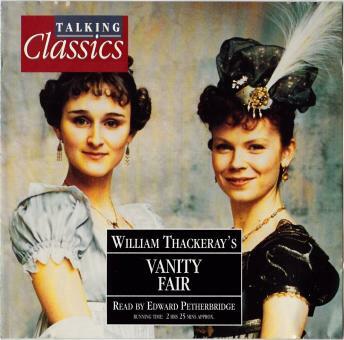 Thackeray's novel is a bitingly satirical depiction of the corruptions of Regency society. But it is also a splendidly readable tale, written in the manner of 18th Century novels. Few of the characters are noted for their virtue, but the zest and enthusiasm with which the narrative bounds along makes the reader overlook, if not forgive, the sins of its rogues and scoundrels. The novel's protagonist, Becky Sharp, goes her own wily way but wins the reader's admiration nonetheless for her resourcefulness and, above all, sheer daring. 1. INTO THE WORLD. Amelia Sedley and Rebecca Sharpe leaves Miss Pinkerton's academy with very different farewells: for wealthy Amelia, wine and a dictionary; for penniless Becky, nothing. At the Sedleys' house in Russell Square, Becky plans to marry Jos, Amelia's brother. The three of them, together with George Osborne (Amelia's beau) and his friend, Dobbin spend an evening at Vauxhall Gardens, Drunk, Jos speak of love to Becky, who expects him to propose. The next day he flees London and Becky has to make her own way in the world. 2. A GOVERNESS'S CAREER. Becky is to be governess to the children of Sir Pitt Crawley and is amazed by the vulgarity of her employer and the squalor of his home. But she soon makes herself indispensable to the family. The younger son, Captain Rawdon Crawly, falls in love with her but she appears to scorn him. When Miss Crawley, a rich maiden aunt, visits, Becky wins her over too. Meanwhile, Amelia is deeply in love with the feckless, if dashing, George. 3. SECRET MARRIAGES. Becky becomes Miss Crawley's companion. This upsets Sir Pitt, who wants her back - as his wife, if she wishes. But Becky has secretly married Rawdon and they flee to Brighton. Meanwhile, Amelia's father loses his fortune and George forgets her until the kindly Dobbin tells him she is heartbroken. Amelia and George marry but when George's father hears of the match, he disinherits him. George and Amelia also go to Brighton, where they meet Becky and Rawdon. There the four receive news of war. Later, George is killed at the Battle of Waterloo. 4. AFTER WATERLOO. Becky and Rawdon settle in Paris, where their son is born. Soon Becky's charm and beauty attract a circle of friends; but she and Rawdon run up debts and are forced to leave for London. Becky pretends that Miss Crawley has left money to Rawdon. In fact, his brother Pitt, married to Lady Jane, is Miss Crawley's heir. Amelia also bears a son and, as George's father refuses to help her, she goes to live with her parents on a widow's meagre pension. Dobbin, who has loved her all along, leaves for India. 5. IN SOCIETY. Becky makes her home in Curzon Street one of the most fashionable house - at least for men; society ladies refuse to meet her. She befriends important people, like the lecherous Lord Steyne, while neglecting her son, Rawdon. After the death of Sir Pitt, she also repairs relations with her brother in law, Pitt Crawley, who gives her diamonds. These she wears when he presents her at court. Meanwhile, Amelia's hardships are worsened by her father's repeated financial failures. 6. DEBT AND DISASTER. Lord Steyne sends young Rawdon to school and persuades Becky to dismiss her companion, leaving the house almost empty. When Rawdon is arrested for debt, Becky defers helping him and writes to his brother instead. In fact, Lady Jane comes to release him and he arrives home to find Becky entertaining Lord Steyne and throws out his gifts of money and jewels. Both Steyne and Rawdon abandon Becky. Even the maid leaves; Becky is ruined and alone. 7. WHEEL OF FORTUNE. Rawdon is made Governor of Coventry Island, a tropical outpost, and leaves England. He settles an annuity on Becky, who departs for Europe. Amelia struggles to make end meet and discovers that her father is utterly ruined. However, she continues to care for him lovingly after the death of her mother. Dobbin returns from India, encountering Jos on the journey home. Dobbin declares his long-enduring love for Amelia, who at last recognises his true worth and accepts his proposal of marriage. 8. JUST DESERTS. Becky is driven from Paris by old creditors, but enjoys leading an increasingly Bohemian life. She neglects her son, until he becomes the heir to the Crawley fortune. Finally she ensnares Joseph Sedley, who leaves her a substantial amount of money when he dies. Rawdon dies of fever on Coventry Island and his son is brought up by Pitt Crawley and Lady Jane, now close friends of Amelia and William. All refuse to have any contract with Becky, who is living a newly respectable life in Bath.